What is the main purpose of the kitchen? Will it be used mainly to entertain guests? Or will it be more functional than social? A kitchen island is a good item to add for a kitchen that will be used mainly to entertain guests. On the other hand, a more functional kitchen may require a tighter work triangle and perhaps a more private work area. Another good idea is to integrate some parts of the house to the planning. For example, you may consider how you can use the outdoor space such as the garden to entertain guests while you utilize most of the space indoors for cooking. Some homeowners prefer quiet and solitary space to eat. If this is the case for you, you may want to use a small space in the kitchen and make it as comfortable as possible. 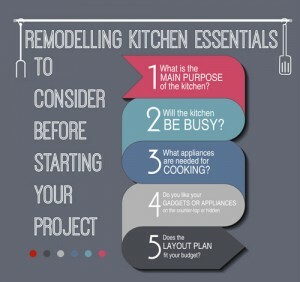 Whatever your preference is, make sure to consider that in deciding how to remodel your kitchen. Will the kitchen be busy? This has a lot to do with space more than anything. The design will work best if you take into consideration the amount of traffic that you anticipate in the room. The more people expected to use the workstations, the more it should be designed to accommodate a bigger crowd and habitual use. Another reason to consider this is the fact that you have to choose the size of the dining table. If you prefer to use a kitchen island instead, consider the number of chairs needed so that everyone is seated comfortably during dinner. What appliances are needed for cooking? Some people prefer to bake while others like to make smoothies and salads. Anticipating the items that you need in the kitchen through the common foods you prefer to make will help nail down the planning process. For example, if you are a baker, you may need to reserve space for a big oven or a baking pantry. Or if you are the type who likes to fry food and requires frying pans and woks, then an overhead range hood is best added to the layout plan. Do you like your gadgets or appliances on the counter-top or hidden? Answering this question will help map out how much space you need for storage. As far as cabinets are concerned, there are plenty of options in the market today. Corner cabinets, for example, are very efficient in maximizing space. So if you prefer your gadgets and appliances hidden, getting a corner space is a good idea. Adding roll-out drawers to the corner space are also good for maximizing space by tucking it in when it’s not needed. Does the layout plan fit your budget? This is perhaps the most important question. The layout plan is not only about the aesthetics. It has a lot to do with knowing how much you will need for the whole project. These questions serve as guidelines to ensure that you organize the plan well enough to know which works and which doesn’t. With proper planning and consideration, you hopefully translate the plan into reality.